Ep. 8: Arista Michelle – Singer, Songwriter, Actress & Writer | Aimee J. Almost every kid dreams of being a singer or actor at some point. Arista Michelle was one of those kids, too. But for her, it was more than the “I want to be famous” kind of dream that most kids have for a little while, but fades in time. Her dream didn’t fade and by the time she was graduated from college and working in her chosen field (computer science), she realized that she wanted to take the leap and chase her dream. But it didn’t work out exactly like she thought it would. Through many detours, unexpected blessings, and opportunities she never saw coming, Arista Michelle was able to live a different life, but still have elements of her dream as rich pieces of the story. 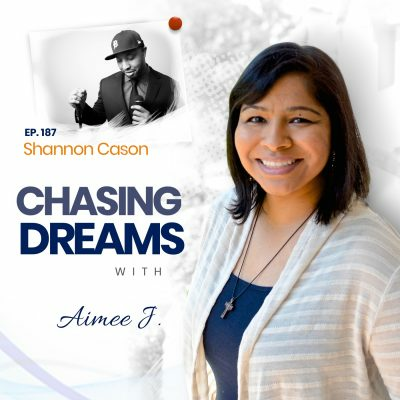 Hear her story on this episode of Chasing Dreams with Aimee J.
It’s possible to reason yourself out of your dreams. The practical side takes over. The realities of life set in. You begin to recognize that your dream may not pay the bills or may not be simple to accomplish, and you give in to the pragmatic and predictable. Sometimes life demands that, which is what happened in Arista Michelle’s case. She didn’t see a realistic way she could pursue her dreams of being an entertainer so she resorted to a steady income and in-demand skill set by pursuing computer programming. She graduated, got a job in her field, and settled down to work for a living. But she was miserable in a job that she hated. That’s when her dream began to awaken and she took the plunge. What happened then? You’ll enjoy it more if you listen to the story from her own lips, which you can do on this episode of the podcast. Are you reasoning yourself out of your #dreams? A move to California to chase her dream. Arista Michelle figured that the only place she could chase her dream of being an actor and singer was in California. So she quit her job, packed her bags, and made the move to Cali. She worked hard, auditioning for various acting roles any time she could. She hoped for a break, or an opportunity to come her way. Then the unexpected happened. She became pregnant. Auditioning became more difficult as the months went on. When her son was born, she struggled to be a parent and chase her dream at the same time. She felt she had to make a choice between her dream and her son. She chose her son. 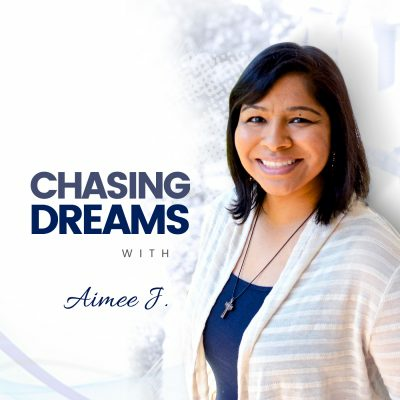 Hear the details of how she made the choice and how it impacted her dream chasing by listening to this conversation. A new career opportunity that she didn’t expect to love. After chasing her singing and acting dreams in California Arista Michelle moved back east to raise her son in a familiar environment and got a job doing graphic design and other things for a local school. That’s when unexpected doors started to open. In time, she became involved in the field of instructional design and found that she absolutely loved it! But she still had the dream of being an actor and singer and found a way she could still pursue it, though it was not with the glimmer and spotlight she once expected. Where did she put her talents to use? In church. Hear how a young woman eager to be an actress in Hollywood traded it for a more humble, but possibly more powerful role in her local church and found fulfillment greater than she expected, on this episode. Our Dreams often come in forms we didn’t expect. That’s how it was for Arista Michelle. Her Hollywood pursuits turned out to be a figment of the real thing, a similar but much different form of the very things she was meant to pursue. Living the life she now enjoys, Arista wouldn’t trade it for anything, not even the dreams of fame and professional acting she once thought were her destiny. She’s happy, content, and still dreaming. One of her goals is to sing in India one day and to continue being a mom and military wife. It’s a life definitely worth living. 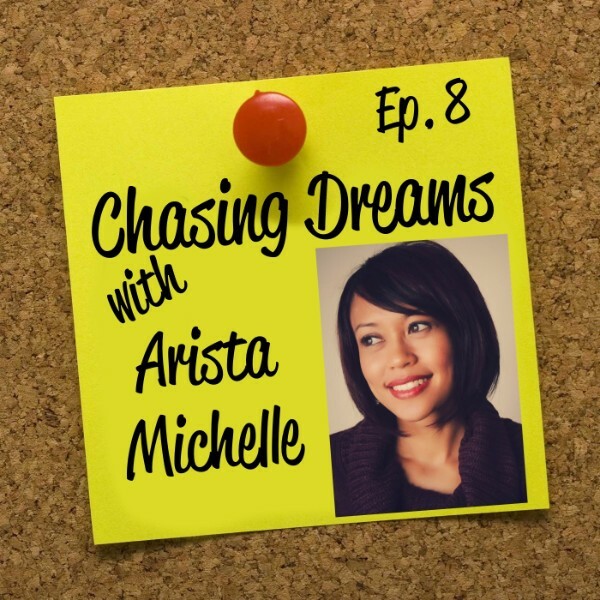 Grab a cup of your favorite beverage and cozy up to listen to Arista’s encouraging story about realizing your dreams in ways you didn’t expect. #Dreams don’t always materialize in the way you expect. [1:15] Welcome to Arista (an old college friend) and Aimee’s introduction of her. [2:25] How college had nothing to do with what Aimee or Arista are doing now. [4:05] How Arista reasoned herself out of the dream she had in college. [6:40] Why Arista wasn’t happy working a J-O-B she hated just to get by. [8:00] Arista’s favorite quote (her recommendation). [9:29] Chasing her dreams in California for a year and a half, and what happened to make her change course. [12:12] Choosing between her son and her dream. [12:45] Making a living as a mom, and enjoying it. [14:01] Gates that were opened in the field of instructional design and how her computer science background made it possible. [16:51] How happiness came in spite of the fact that her current work role is not the field she studied for in college. [17:38] Living out portions of her dream in ways she didn’t expect while still doing a job that was outside that field. [19:20] Arista’s desire to use her talent to serve God and how that evolved into her dream being realized in an area she didn’t expect. [20:41] The current way Arista is pursuing her dream as her own agent and singer/songwriter. [22:09] Arista’s new book (free PDF version if you’d like), Youtube channel, etc. [24:26] Not an easy path, but doing what she loves is still the path she’s on. [25:06] The importance of following her calling above all else. [25:50] Arista’s goals: singing in India. [26:45] Aimee’s rapid fire game. Aimee and Arista take turns blurting out “areas of study” and the first one to make something up, hesitate too long, or blank out is the loser. Who’s going to be the winner? Is your #dream possible, just not in the form you thought it would be?